Spending 12 months studying European foods with special focus on traditional and local ones has given me an insight what really these people consume. Consumption is only one end aspect that I came across but the know-how, the raw materials and the geographical location of the food sources are of major importance in the over quality considerations and preferences. Mentioning Europe as a whole may be misleading as I have only visited four countries [France, Italy, Romania and Spain] and at the same time generalizing the foods that exist in these countries is beyond what I studied so far though the overall principle share same concept of production modes. Traveling to four countries in 12 months can give an introductory experience having in mind the rich food resources produced. So far, I have come across French cereal, milk and meat products, wine, milk, olive oil and meat products from Northern part of Italy as well as wine, milk, olive oil, forest and meat products of Spain. The diversity and range is huge to be covered but writing about them is worthy to put in my blog pages. Understanding the energy that it may demand, I dedicated my post to cover 100 French Cheeses now. My interest on cheese is based on my experience with this magic food. Saying magic for some could be for fun and an exaggeration. Seriously it is not. Coming from the horn of Africa and become a producer of this new milk product is bizarre. This bizarreness has lead me to distance a little bit till then from being an ardent consumer and yet creating a strong passion that it may affect my future professional carer. 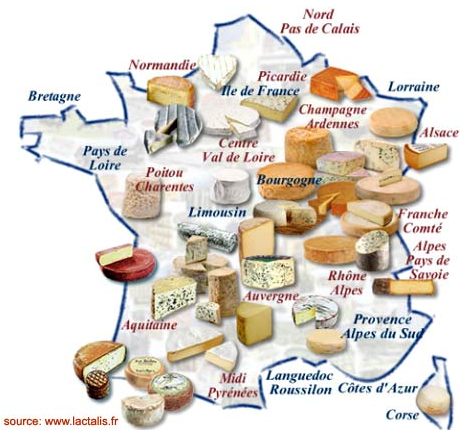 This is then my basic motive to post 100 selected French cheeses here. 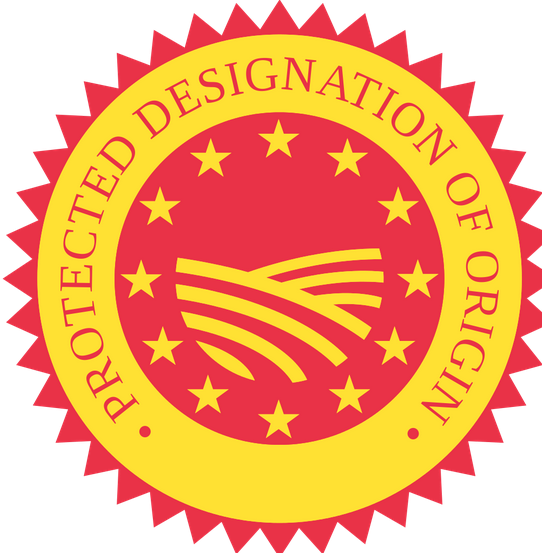 Under the Common Agricultural Policy of the European Union and a going world agreements on nomination of origin related food products, some foods are registered as protected products. These protections may fall into three categories, Protected Designation of Origin (PDO) [its French version, Appellation D’Origin Controlée (AOC)], Protected Geographical Indication (PGI), and traditional specialities guaranteed (TSG). Each has its own seal put on the packaging. To recieve either mark, the product passes certain criteria set by a body assigned for such tasks. In France for example, INAO is responsible for such labeling works. PDO/AOC: This mark is given to a product that is locally and entirely manufactured within the name of an region and thus acquire unique characteristics. The quality of the product is significantly determined by the geographical environment, including natural and human factors. PGI: The entire product must be traditionally and at least partially manufactured (prepared, processed or produced) within the specific region and thus acquire unique properties. Is basically associated with the name of an area, a specific place or, in exceptional cases, the name of a country, used as a description of an agricultural product or a foodstuff. 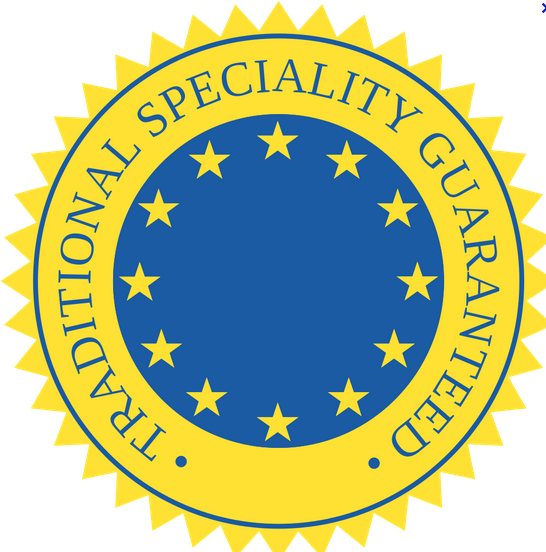 TSG: Given to traditional food products of specific character. To qualify for a TSG a food must be of “specific character” and either its raw materials, production method or processing must be “traditional”. 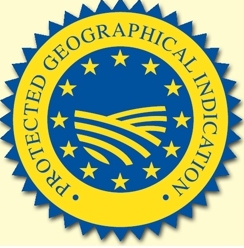 Differing from PDO and PGI, this quality scheme does not certify that the protected food product has a link to specific geographical area. 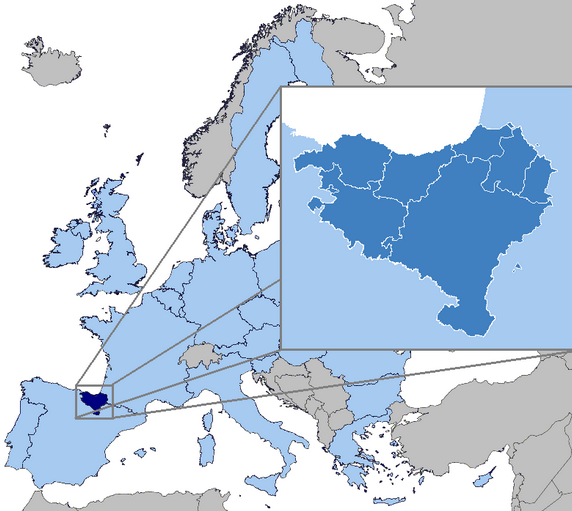 Coming from the Pays Basque region, it is a French traditional cheese obtained from unpasteurized(raw) sheep milk. 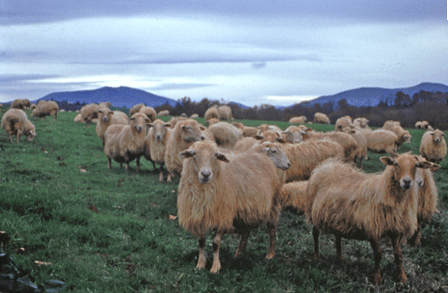 The sheep breeds are of the red-nosed Manech ewes (an old local breed). Abbaye de Belloc is also known as ‘Abbaye Notre-Dame de Belloc’ since it was produced by the Benedictine monks at the ‘Abbaye de Notre Dame de Belloc’ from the milk obtained from the sheep milk that is collected and brought into the monastery from neighboring farms. Abbay de Belloc is still made in the traditional manner. It has a fine, dense texture and with fat content of 60%. The milk Abbaye de Belloc has a true Basque character, and it is believed that many centuries ago the monks from the Belloc Monastery first taught the Basque shepherds how to make cheese. Proper care in the right maturing conditions will accentuate the rich, caramelized flavors that make this cheese so addictive. Aging process of the cheese ranges from four to ten months. The cheese has a firm, dense, rich and creamy texture. The taste resembles burnt caramel and there is a distinctive lanolin aroma. 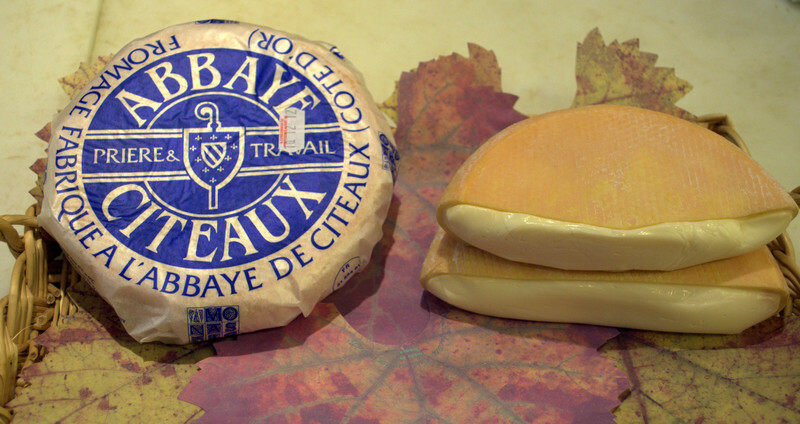 Abbaye de Belloc is a designated AOC cheese, which means that it is protected by the Appellation d’Origine Contrôlée system. Strict rules govern every element that goes into the making of the cheese. 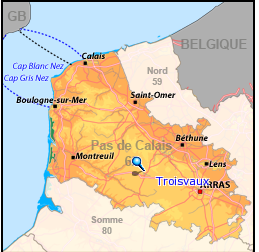 Known as Le “Trappiste de Belval” or “Belval” is manufactured in historical Picardy province of North France by Trappist sisters. The disc shaped, semihard cheese obtained from cow’s milk and is matured for about 60 days in the cellars of the abbey with great care. Texturally, it has an ivory white paste and a smooth, glossy, golden, washed rind with a light aroma. It has been manufactured since 1893 by the sisters of the abbey. The Belval cheese makes a perfect pair with all light, fruity red or fullbodied red wines such as Beaujolais, Chinon, Champigny and many more. It has a fat content of 40-46%. This classic, washed rind cheese made from cow’s milk comes from the Citeaux Abbey, located in Burgundy, France. Frère Frédéricand Frère Joel run the creamery at the Abbaye de Citeaux. The milk is derived from red and white Montbéliarde cows that graze on the flat meadow surrounding the abbey for at least 6 months. The Abbaye de Citeaux cheese takes its name from the order of Cistercian monks who founded a monastery in Burgundy. 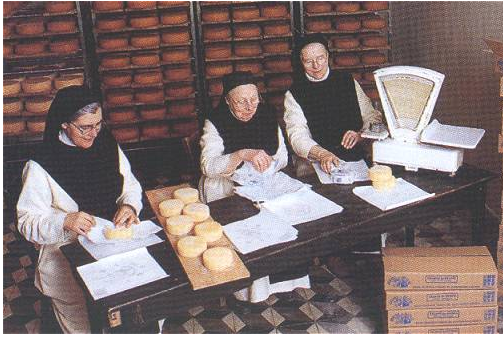 The monks of the abbey of Citeaux produced a cheese using cow’s milk, and similar to saint-Paulin, but with a fruitier flavour. This cheese is artisan produced by a monastery. It is circular shaped with a diameter of 18cm, a thickness of 4 cm and a weight of 750g. The cheese is matured for two months on average, in a humid cellar, where it is washed regularly. Exterior appearance of the Abbaye de Citeaux cheese is smooth rind of a bright ochre colour having weak odour. It has a soft and elastic texture with very fruity taste. Only 300 cheeses are manufactured every Monday and Tuesday, most of which are sold at the Abbey shop. 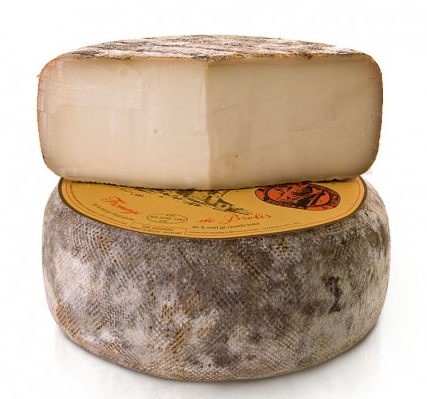 The Abbaye de Citeaux cheese has a pungent aroma that overpowers the flavor of cheese. The texture is supple and semi-soft with an ivory white color for the dense and smooth interior paste of the cheese. The cheese has earthy, creamy and milky taste. Volnay or any light Burgundy wine is good for pairing with Citeaux cheese. This 14th century cheese took its name from a small commune called Abonance found in a geographical location of the Haute-Savoie department of France . It is a semi-hard, fragrant, raw-milk cheese. It’s , the Alps. It is exclusively produced in that particular area and the know-how of making the cheese only originates there. This special character makes it as Protected Designation of Origin, in French called, “Appellation d’origine Controle (AOC) since 1990. The milk is obtained from three types cattle races, the Abonance, montbéliarde andTarentaise breed and produced by farmers who live in Abonance, Chablais and Haute-Savoie. The milk is warmed to 32° Celsius – the temperature of the cow’s udder – and the curdling process is started using natural rennet. It is then left to curdle by leaving it to rest for 3 to 4 hours. The next step is to break up the curd with a curd knife. This results in pieces about the size of a pea. After being stirred continuously for an hour and a half, the resulting curds are heated to 50°C in a copper cauldron. The curds are then ‘lifted’ with a linen cloth and drained in moulds before being pressed. The curds have now turned to cheese, which is then submerged in brine for twenty-four hours before being placed on spruce planks where it begins its three-month maturing process. The cheese is carefully looked after, being turned on one day and then rubbed with salty water on the next, and so on. 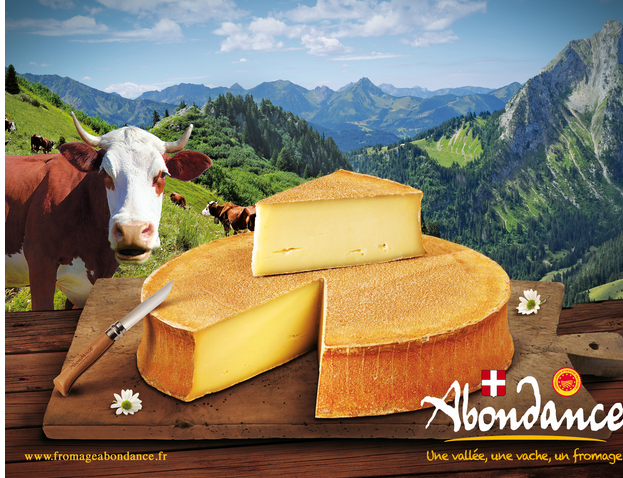 At the market and in shops, the amber coloured Abondance is sold in rounds weighing between 6 and 12 kg. Made both in dairies and on the farm, over time the cheese takes on a more perfumed, fruity character. It has a strong smell and an intensely fruity, buttery and hazelnut flavor, with balance of acidity and sweetness, followed by a lingering aftertaste. Unearth an aroma of nutty vegetation as you slice the cheese. However, remember the crust including the gray layer beneath, should be removed before eating. Firm but supple and slightly grainy, the texture of the ivory-yellow pâté is creamy and velvety. Its rind is smooth with an amber color showing canvas marks. The affinage takes at least 100 days, so all the subtle aromas are realized. 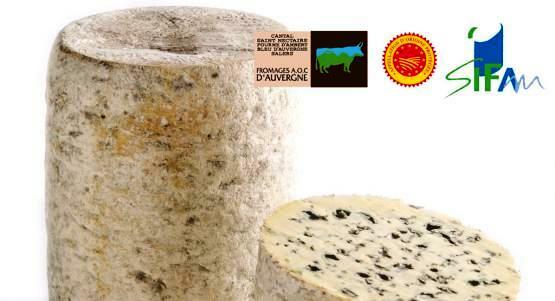 Got its AOC status in 2002, Fourme d’Ambert or simply Ambert, is produced in the Auvergne region. The Druids and the Gauls are believed to develop this cheese dating back to the Roman occupation of France. According to legend this cheese was in production at the time of the Druids and the Gauls and its main market soon became the town of Ambert whose town hall is in the shape of a circle, like the cheese itself. 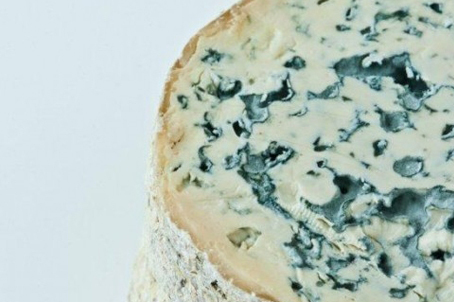 Fourme d’Ambert is more supple and dense than most blues. Milk from cows grazing on either lower or higher mountain pastures is used to produce the cheese. Although, the cheese matures in 40 days, it is cave-aged for two-three months for optimum quality. During the aging time, it is injected with Vouvray moelleux, a sweet white wine. It is easily recognizable by its unusually tall cylindrical shape. The pâté is cream colored with prominent blue veining. 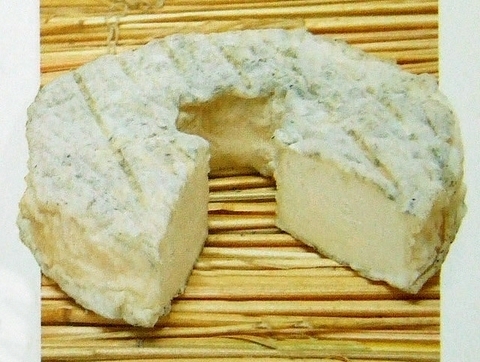 The cheese is inoculated with Penicillium roqueforti spores for the growth of blue veins. Slightly tangy, savory flavor infused by the bacteria, beautiful complements the distinct notes of butter and cream. To appreciate the lighter flavour of this cheese it is best enjoyed simply with a crust of bread or as dessert course accompanied by a sweet wine such as Sauternes. This is a soft French artisan cheese, made from unpasteurized cow’s milk. 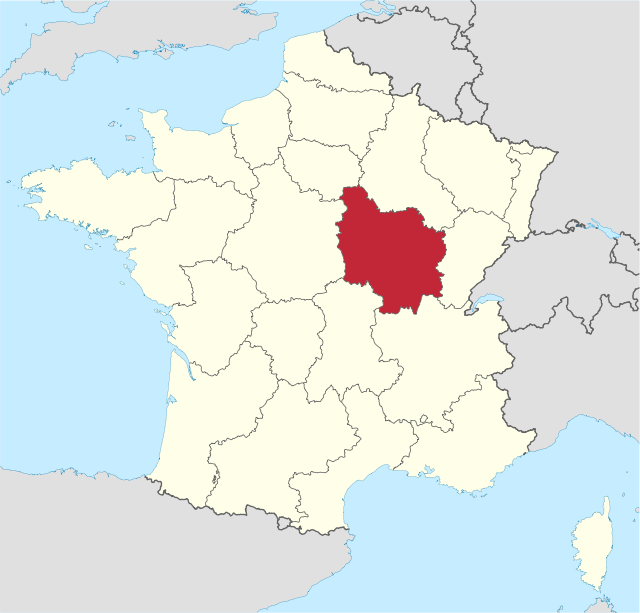 The cheese is produced in the Gevrey-Chambertin in Burgundy. It is a washed rind soft cheese that is made using the skills and know-how inspired by the farm women of Côte d’Or. 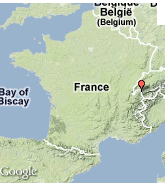 Its name is derived from the wine-making region in which it is produced. It is an Epoisse type gourmet cheese. The orange and moist rind is washed with Marc de Bourgogne, which is a type of brandy. The ripening of the cheese takes place from the outside in. The ivory pate is strong with a sharp flavor and a buttery finish. It has a fat content of 45%. 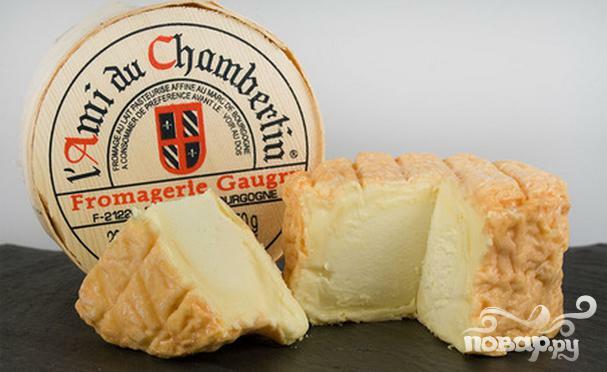 Ami du Chambertin has pronounced aromas and a thin, flexible, wrinkled and shiny and orange/red rind in colour. In terms of flavour, this cheese is powerful at the edges and more subtle and creamy at the heart. Produced in Bigorre, Pyrenees-Atlantiques region, Anneau du Vic-Bilh is a type of cottage cheese with round shape of 10 centimetres ring and 2.5 centimetres hole in the middle resembling a donut. It is prepared from unpasteurized goat’s milk using animal rennet. This handmade cheese produced on farms in Foix is covered in charcoal to present a slightly blue colour. It has a soft white pate with a nice balance of salt and acidity. 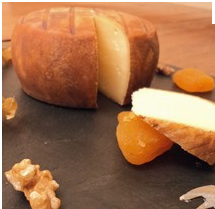 Upon consuming, the cheese stimulates an earthy and nutty flavor with a rich creaminess. It is uncooked and unpressed cheese with 45% fat. Aromes au Gene du Marc is a French, traditional farmhouse cheese from the Lyonnais region produced in wine growing regions several months after the last of the vintage. This unpasteurized cheese is produced in small truckles. It has a strong and bittersweet flavor and a distinctively yeasty characteristic. An ideal partner of wine, Aromes au Gene de Marc is made from mixed cow’s and goat’s milk and immature cheese such as Rigotte or St Marcellin. It is macerated or cured in vats of fermenting grape skins and pips (known as marc). The resulting cheese is a small, 80 to 120g round with a strong, bittersweet, yeasty taste and aroma. During its maturation period, the cheese changes it’s texture dramatically from creamy-moist when young to flaky-hard when aged. After maturing, it develops a powerful pungent taste as well. It is then rolled in a marc (mass of skins, seeds and stalks left behind after extracting juice from graphes) before being sold.